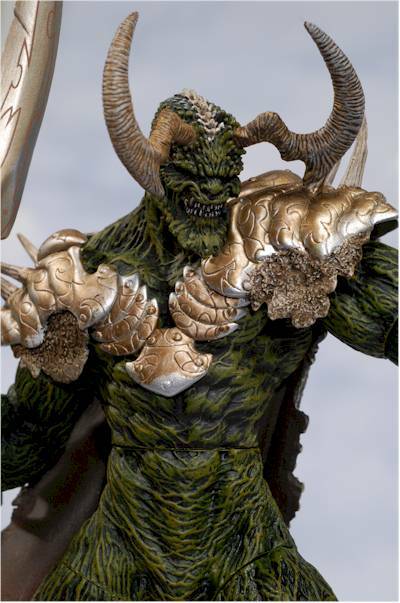 Spawn is one of the longest running series of action figures in the last dozen years. We're on series 29 now, with no end in sight. Of course, it helps that it's the companies flagship property (along with Sports Picks), and that the actual theme of the line can vary tremendously from one series to the next, always giving it a fresh feel. But at the end of the day it's still Spawn, and 29 waves is whopping. The latest series is called "Evolutions", and includes Spawn and his buds starting with comic #150. This was sort of a turning point in the books, with a slightly updated design to his costume and some new characters thrown in the mix. 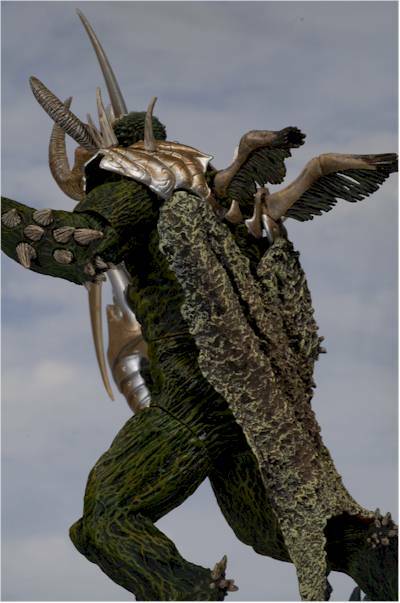 In this wave we have Spawn in his new look; Zera, a new Angel battling against the forces of evil; Thamuz, a demon known as the Master of Torture; Disciple, a warrior from Heaven that tore Spawn up first time around; a new Ninja Spawn; and the "Man of Miracles, a possible ally for Spawn. I picked up Thamuz and Zera, the two most interesting in this set for me. There's quite a bit of controversy over Man of Miracles, with legal battles between Todd and Neil Gaimun, owner of the Miracle Man, but that's one I'll not be discussing. Not because it's not worth discussing, but I simply haven't been following along well enough to form an educated opinion. I grabbed these two at Toys R Us, and you can find them at plenty of online stores as well. I have the usual recommendations at the end of the review. Expect to pay around $10. It's the basic clamshell design, with a reasonable paper insert. In case you've forgotten, this is a package design that Mcfarlane pioneered. They actually used it for awhile, stopped using it, and then returned again. I do wish they'd do more with the insert though. This line is a perfect example, since folks that don't keep up with the comic will have little or no idea who characters like Zera or Thamuz are. A basic introduction on the insert would be a huge improvement. Another improvement would be some basic instructions, when applicable. Thamuz is a great example, because the 'hilt' of his weapon comes apart to allow you to put it in his fisted hand. Now, I knew for a fact that it came apart. It had to. But how and where? Pulling on it slowly finally worked, but I could have easily broken it as well in my attempt. A simple drawing explaining it (the entire back end of the hilt, separate from the handle itself, pops off) would have been a useful addition. If you're looking for super articulated figures, the Spawn line (generally, although there have been a couple exceptions) is not the place to be looking. 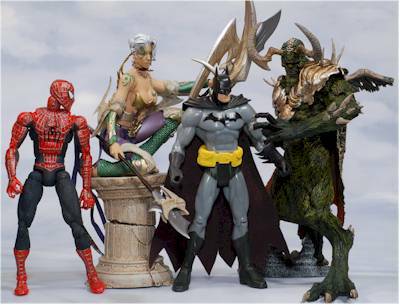 These are plastic statues, often designed to look like specific panels or covers from specific issues. Because of that, the sculpt and paint are paramount. 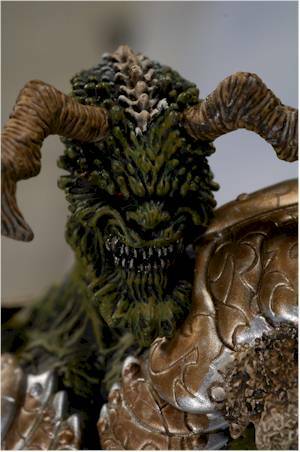 Thankfully, Mcfarlane rarely fails in the sculpt department. Both of these figures are in very dynamic, interesting poses, with plenty of eye catching personality. 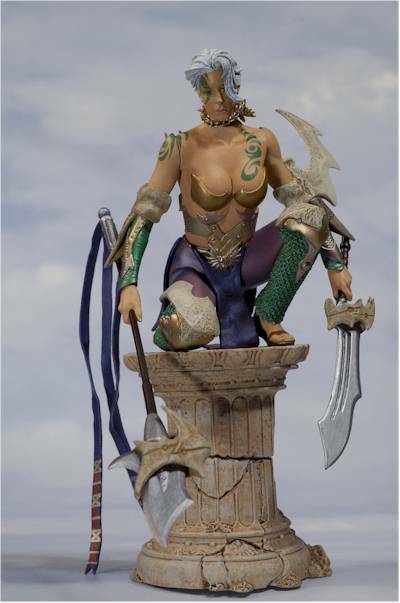 Zera is perched upon an ancient pillar, weapons in hand, stern yet beautiful expression on her face. She's about to engage in battle, but isn't yet in the midst of it. The detail work on her costume, with varying textures and materials, is truly impressive. In particular, the chain mail on her lower legs is amazing in it's detail and lifelike realism. While some of her costume might seem familiar - it appears that her and Wonder Woman have the same designer for their bust armor - there's enough uniqueness to the design that she'll stand out easily amongst the previous Angels. Thamuz is all demon, with all the standard trappings. 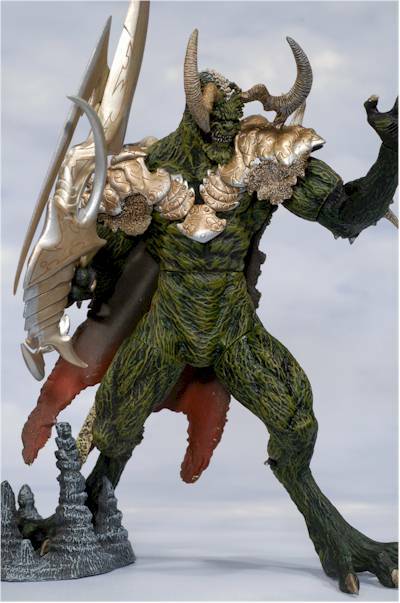 His design has some unique flavor though as well, and it's not so much in the extraordinary details (the cape, the horns, the clawed hands and feet) but in the particular combination that he gets his interesting appearance. 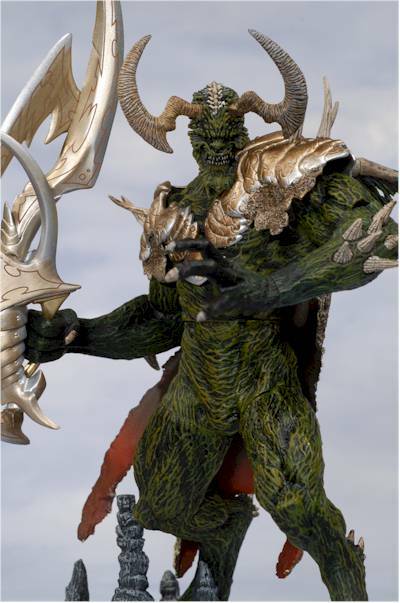 His sculpt loses slightly here though, when competing with Zera, because of the awkward head pose. The articulation doesn't help, and he really only looks good with his cheek against the armor plating covering his chest and shoulders. I would have liked something less extreme in the head position, but it's still a fairly minor nit, considering the overall quality of the sculpt. The hands on both figures are sculpted to hold their accessories, and Zera can be posed on just about any surface in her crouched position. Thamuz only stands well with his included base however, but it's a small and fairly unobtrusive base. One of the nice things about the various versions of the Angels in the Spawn line (ignoring the obvious T&A) is the use of color. In general, the Spawn demons and monsters have a lot of the brown/red/green thing going on, with a fair share of black thrown in for good measure. But the Angels have bright colors, sharp contrasts, and visual pop. Zera has all that and more. The spifftastic costume lends itself to a terrific paint job, and they've complied nicely. There's plenty of detail, and most of it is clean and neat. My only complaint would be the blue wash in the hair, which is a bit heavy handed and overdone. Thamuz is a tad less colorful, but he is a demon after all. There's a nice wash used on the body to pull out the sculpt, and while it's a bit heavier than we usually see from Mcfarlane, it still works quite well. Perhaps that's because the body and face detail on Thamuz is so deeply cut, that they heavier wash doesn't dilute the work as much as it could. My nits here are pretty minor as well though, and Mcfarlane Toys has done another impressive job with both the sculpt and paint on these figures. I wish their Simpsons line was getting the same level of quality on the paint application that the Spawn series always sports. Neither of these figures is super articulated. If you go in knowing and accepting that, this category is likely to carry little weight. However, if you prefer all your action figures to have action, this category will hit your overall score pretty hard. Zera has a cut neck, cut shoulders, cut forearms, cut wrists and cut waist. The arm articulation is the most useful, allowing you to position them in a handful of ways. The neck works alright, but she really only looks good with the head within a few degrees to either side of one position. Thamuz also has a cut neck, but his dynamic sculpt really allows his head to only be in one spot. Turn it at all and he looks goofy. He also has cut shoulders, cut elbows, cut wrists, cut waist, and a V-crotch. Each of the tiny wings can also be moved on his back, since they are ball joints. His articulation is good for a few poses too, but his head really limits how much you can do with the rest of the articulation. Zera comes with two weapons and her base. The base, an ancient column, looks terrific and is just about the right size. The pegs are in the base, not her legs, so she can easily rest on other surfaces if you prefer. She can hold the weapons in either hand, and her limted arm articulation works well with them. Both look terrific, and the soft purple ribbons on her spear match her costume accents. Thamuz also has a base, but his is much smaller. It is cave-like, and is designed to assist with one foot. You'll need to use his to keep him standing, but it does look good and works well with the theme of the character. He has a single weapon, a massive looking device of pain and injury. It fits great in his right hand, once you figure out how to pull the hilt off. While neither of these figures are really designed as 'toys', Thamuz does have some play potential due to his look. Every kid loves a monster, and Thamuz's construction is sturdy enough for basic abuse. The weapon might not make it more than a few minutes before either a) breaking or b) taking out an eye, but the basic figure can actually work as a toy. Zera doesn't do as well here, simply because she's a plastic statue for big boys to oogle, especially if those big boys have a thing for Amazonian women. Spawn figures remain one of the very best values on the market. At just $10 each, they are at least two bucks cheaper than the majority of their competition, and they remain some of the very best in sculpt and paint. Hunt up the best paint application you can of course. I've heard issues with some Thamuz's missing a horn in the package, so it's worth keeping an eye out to be sure you get all his pieces. And of course there are the two versions of Zera, "censored" and "uncensored". The one I have here is considered uncensored, although I'm not sure why the need to censor. The other version has an additional piece of rubber blue cloth coming down off her neck, providing a little more cleavage control. I've been buying Spawn figures since series 1. And in all that time, and in all 29 waves, there hasn't been a single time that there wasn't at least one figure in the series that impressed me with its appearance. No, these aren't Marvel Legends or Street Fighter figures, with lots of articulation and play value. But that's not what they're shooting for, so it's no surprise they miss. When it comes to what they are going for, highly stylized plastic statues, they're right on the mark. The only time they miss is if the sculpt or paint are off, or if the particular pose they select - always a crucial factor - doesn't grab you. This is the danger when you go with a more static pose, something that's more art than action. Art becomes extremely subjective, and what the artist might find appealing may not turn out to be so with the buying public. I'm very happy with this pair, and I might give the Spawn from this series a second look too. I think if I had more back story on Disciple, he might interest me as well, and that's one of the reasons I think it behooves Mcfarlane to include that info with the figure. Hey, a little mini-comic bringing the buyer up to speed wouldn't be bad either. - CornerStoreComics has the individuals for $11 each, or the full set of 6 for $60. - Amazing Toyz has the singles for $11, and the set for $60 as well. - Killer Toys has the set of 6 for $65, or a case of 12 for $105. - YouBuyNow has the singles for $12 each. 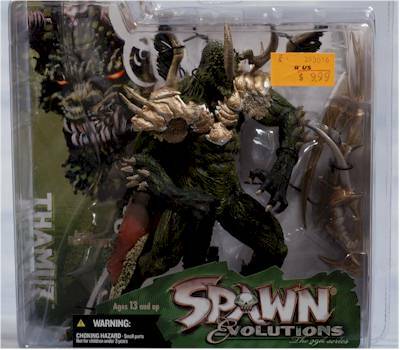 - Clark Toys doesn't carry Spawn...but they do carry every other Mcfarlane license, especially Sports Picks! If you're looking for anything in the NBA, NHL, MLB or other sports lines, try Clarks first. - there's also the 12" Spawn from i.95. And that's a lot of Spawn reviews! Figure from the collection of Warren.